CEI's Cisco OEM Equivalent cables offer the same exceptional quality for a fraction of the cost. Our cables are available in custom and standard lengths. Cisco equivalent cables are manufactured to the original OEM specifications. 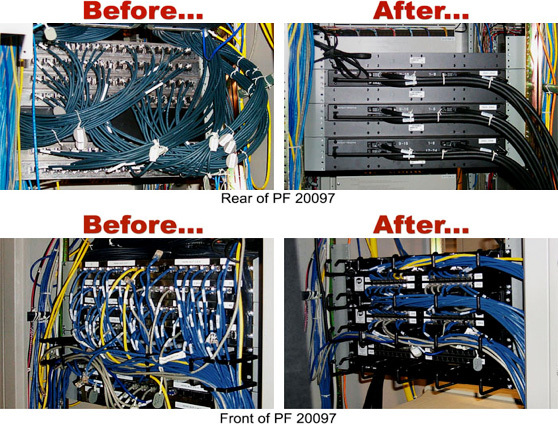 Components Express, Inc. has provided many economical solutions to customers who utilize complex cable assemblies by designing custom patch panels to replace excessive cabling "spaghetti." You get manageability, reliability, savings and space through the compact design of our 1 RU (rack unit) networking panels. Our patented patch panels utilize the latest technology and are engineered to the highest standards. CEI offers commodity cables and custom variations on every line. Our specialty is working with OEM engineers to create solutions never thought possible. Our cables are cut, measured and stripped to a +/-.015" tolerance using CNC equipment. (Tighter tolerances are available.) NASA 8739.4 standard is utilized to provide aerospace quality to every application. All cables are electrically tested for continuity, polarity and resistance. Soldering is performed on our wave solder equipment, certified to NASA Standard 8739.3. We measure each contact during setup to ensure proper crimp dimensions. Our cables must pass a minimum pull test greater or equal to 80% of the tensile strength of the wire. We stock thousands of different connectors and cables for your custom application. Coil cables are available as terminated and non-terminated assemblies. The 32 Port Octal Async Patch Panel interfaces banks of 8 RJ45 connectors on the front of the panel to 4 SCSI 68 position connectors on the rear. Designed for use with Cisco Asynchronous network modules NM-16A & NM-32A (utilized on Cisco 2600, 3620/40 and 3660 series routers). The 32 Port HWIC Patch Panel interfaces 32 RJ45 connectors on the front of the panel to 4 SCSI 68 ports on the rear. The panel is designed to work w/ Cisco Asynchronous High Speed WAN Interface Cards, HWIC-8A and HWIC-16A (utilized on Cisco 1800, 2800 and 3800 Integrated Service Routers). The patch panel replaces 4 CAB-HD8-ASYNC cables. The PF 2800 includes mounting hardware and we offer a variety of cable length options. Each cable allows up to 16 asynchronous ports connections. The 8 Port V.35 Feed-Thru Patch Panel offers eight 34-position V.35 feed-thru connectors on the front and rear of the panel. The panel may be used with any type of V.35 interface, however, was specifically designed for use with Cisco Synchronous cables such as CAB-V.35-FC, FT, MC and MT. PF 16SSRS232 offers flexibility not previously available, the utilization of DCE & DTE interfaces--all in one unit. The Smart Serial RS-232 Panel eliminates the need for Smart Serial cables CAB-SS-232FC & CAB-SS-232MT. This panel was designed for use in Cisco Modules: NM 4A, 8A and 16A. The 16 Port Octal Modem Patch Panel interfaces banks of 8 DB25 connectors on the front of the panel to 2 SCSI 68 position connectors on the rear. Designed to work with Cisco NM-16A & NM32A, which are utilized on Cisco 2600, 3620/40 and 3660 series routers. When ordering, please specify DCE, DTE or Modem. Panel features: power monitoring terminals--for terminating one Cisco NM-AIC-64 w/ terminal strips for monitoring 8 power feeds up to 20 Amps per feed. The panel also allows for 56 discrete alarms. The 8 analog alarm points are connected directly to the 8 power feeds for monitoring purposes. Each of the 8 power feeds is protected with a 20 Amp fuse. Visual representation of supplied power and fuse state are provided with L.E.D.s. Patch panel for terminating up to two Cisco NM-AIC-64s (Alarm Interface Controllers). Each side of the patch panel allows up to 56 discrete alarm terminations (112 total), 8 analog alarms (16 total). A terminal strip is provided so that alarms may be powered by a single 500mA DC supply. This single supply eliminates the need to source power to each individual alarm. The 8 Port T1 Patch Panel has 8 RJ45 ports on the front which are interfaced with 32 Telco compatible wire wrap pins on the back. The T1 panel interfaces Cisco ATM network modules NM-8T1-IMA & NM-4T1-IMA. The T1 Patch Panel is compatible with T1 applications, including DEMARK extensions.